As a book it’s excellent... a great way of story telling. It’s more like a novel then a historical book. The book is very interesting and it’s difficult to put down... once you start reading it. Broadly, the book starts with Louis Mountbatten’s appointment as a viceroy of India and ends with assassination of Mahatma Gandhi. It is always said that this book is not written by an Indian neither by a British and hence it is a true and impartial depiction of incidents. Well… The book is based on many interviews and mainly with Mountbatten. It can be observed easily that the views/incidents mentioned in book are not totally impartial and are highly influenced by Mountbatten(s). The depiction of Gandhi in book is just excellent. I liked those chapters… I think the book has one of the best descriptions of Gandhi and his ideologies. The depiction of Gandhi’s personality is amazing and it seems that Movie Gandhi (one of my all time favorites) is inspired by this book. Gandhi was Gandhi… undoubtedly one of the greatest men born… but the chapters about Mountbatten are something which doesn’t seem to be true at many places. He was a good friend of Nehru and he became first governor general of independent India but being credited for every good thing is something unbelievable. Whenever something went wrong author put the responsibility on Nehru-Patel but Mountbatten was just perfect, he only did good things, always took right decisions, had enormous power in his hands… Unbelievable!! The Jinnah as an evil… well I don’t know much about him (except wikipedia and some small writings about him). So, I can’t say it’s true or exaggerated. But (I read somewhere)… If we look back at the history of India and Pakistan… it seems that the depiction of Jinnah and Nehru is more or less true. The chapter on Maharajas is very entertaining and interesting… well they were there and thats why there was British Raj. The portrayal of Raj is also justifiable. I think that the author should have mentioned something more about common Indian people. At the end a reader will feel that Indian people are filled with hatred and killing… that’s again a misleading for a person who is unknown of India/Indians and reads this book. Also, author should have mentioned somewhere about the other Indian leaders/freedom fighters their views and influence on Indian people (like Subhash Chandra Bose etc). One more point… below a photograph the book introduces Savarkar as ‘a homosexual Hindu fanatic’ but in book its nowhere mentioned. This was the first time I heard of Savarkar being a Homosexual and without proof I don’t believe this fact. 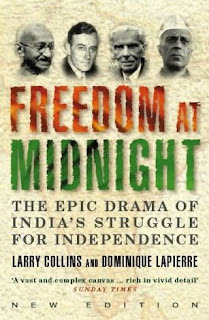 The riots and partition are something which is greatly explained in the book. The horrifying picture of Hindu-Muslim riots in Lahore/Calcutta and other places is just perfectly portrayed. I believe, No one can explain the tragedies of partition better than that. Last but not the least… the short stories and interesting footnotes are just great… I will again say… great writing style... worth reading.